Before it snows, collect as many big pine cones as you can find. If you don’t have pine cones where you live, a local craft store or nursery may sell them. Stock up on at least a dozen, because these will be very popular feeders with your bird friends, and you’ll go through them before you know it. You’ll also need to have craft wire, a thin flexible wire that you can buy for a couple dollars in the craft section of a drug store. You’ll hang the finished feeder with the wire. You don’t want to use ribbon or string, because enterprising chipmunks and squirrels will quickly figure out how to gnaw through the ribbon and carry off the entire pinecone to eat in the privacy of their burrow. The wire will prevent that. You’ll also need smooth peanut butter. I recommend that you devote a jar of peanut butter to the birds, keeping it separate from your family’s peanut butter. You can reuse each pinecone several times, and in the interest of not spreading bird germs to your family, this seems a prudent precaution. If you’ve collected your own pine cones, they may be slightly sticky with sap. Line a cookie sheet with tin foil, and layer with pinecones. Put them in a 200 degree oven for 20 minutes. The sap will dry and harden, and you’ll get a great pine smell in your house at the same time. Then, take six to eight inches of craft wire. It should cut easily with scissors. Twist about two inches of it around the top of the pine cone, creating a noose that slides under the top layer of scales. It doesn’t have to be too tight, and a few twists of the wire should secure it adequately. You want the pine cone to dangle from six or so inches of the wire. Next, generously slather each pine cone with peanut butter from top to bottom, getting it up under the scales. Sprinkle a few handfuls of bird seed onto waxed paper. Roll the pine cone into the bird seed, covering it completely. Now bring them outside to your favorite tree and twist the top couple inches of wire around a branch. When thinking of where to hang the pine cones, you might want to consider that most birds won’t land on the pine cone itself, but will hop on a neighboring branch to eat from it. Place your pine cone so there are a couple convenient spots for birds to land next to it. Then go back inside and enjoy the excitement the pine cones generate. Birds love them and little furry friends do too. 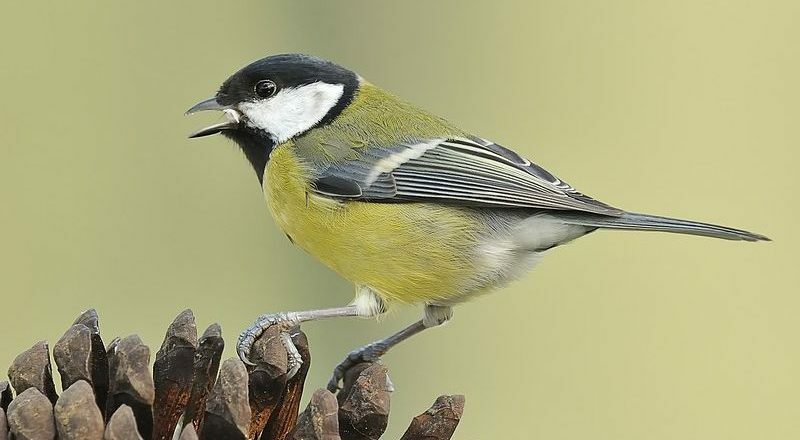 Small birds, such as chickadees, can feed from a few pine cones for days. Larger birds, such as blue jays, can polish off a few pine cones in hours. Peanut butter pine cone bird feeders are an especially nice treat for birds in very cold and snowy weather. Making them is also a very child friendly activity. With a little help twisting the craft wire, even the smallest and pudgiest fingers can create a yummy winter treat for birds. Thanks for the very explicit instructions. I am planning an activity for some young girls in the near future. We are going to have a fun time doing this for the birds. Again thanks. Hey Buddy!, I found this information for you: "Homemade Peanut Butter Pine Cone Bird Feeders". Here is the website link: http://backyardbirdingblog.com/peanut-butter-pine-cone-bird-feeders/. Thank you.